Note:-(i) The name ,age limit, and qualifications of this post has been prescribed as per the GO (P) No.60/2010/F&WLD dated 30.08.2010 (SRO No 861/2010) and GO (P) No.84/2014/F&WLD dated 20.09.2014 (SRO No 574/2014). (ii) Candidates are prohibited from applying to more than one district in response to the notification. If applications are submitted contrary to the above direction and if he or she is selected, his or her name will be deleted from the Ranked List and disciplinary action will be taken against him/her. Candidates already in Government service holding the same post in any one district are prohibited from applying again for this post but they can apply to higher posts when notified. (iii) Separate ranked lists for each District will be published. The Ranked list thus published shall cease to be in force after one year from the date of finalisation of the ranked list or after one month from the date of commencement of training in respect of the last batch advised from the ranked list within a period of one year from the date of finalisation of the Ranked List whichever is later. Candidates will be advised from the said list against the vacancies that may be reported to the Commission in writing during the period of currency of the Ranked List. 5. Method of Appointment : By Direct Recruitment (District wise)Note:- Quota reserved for the Direct Recruitment shall be 70%. The appointing authority shall assess the number of vacancies and advice shall be made against the vacancies reported. Pass in Plus Two Examination conducted by the Board of Higher Secondary Education, Government of Kerala or equivalent examination recognised by Governmentof India or Government of Kerala. Note:- Rule 10(a)ii of KS & SSR is applicable. (i) Physical Standards: Height-A minimum of 168 cms, Chest-A minimum of 81cms around the chest and must have an expansion of 5 cms on full inhalation. Note: Minimum height measurement of Scheduled Caste/Scheduled Tribe candidate shall be 160 cm. The minimum chest expansion of 5 cm shall be made applicable to the Scheduled Caste and Scheduled Tribe candidates. All the male candidates must qualify in any of the Fiveevents out of the Eight events specified below of the National Physical Efficiency one star standard test. (iii) Endurance Test: All male candidates shall successfully complete an endurance test of running 2 Kilometres in 13 minutes. Note: Minimum height measurement of Scheduled Caste/Scheduled Tribe Female candidates shall be 150 cm. (ii) Physical Efficiency Test: All the Female candidates must qualify any of the Fiveevents out of the Nineevents specified below of the National Physical Efficiency one star standard test. Endurance Test: All female candidates shall successfully complete an endurance test of running 2 Kilometres in 15 minutes. i. Physical Measurement of candidate will be taken prior to the physical efficiency Test and those who do not possess the prescribed physical measurement at that time will not be admitted for the Physical Efficiency Test. If accidents or injuries happen to a candidate while participating in the physical efficiency test/endurance test, he/she will not be given further chance to participate in the test. Both male and female candidates must possess medical standards prescribed below. (i) Ear:Hearing should be perfect. (ii) Eye: Must be certified to possess visual standards specified below without glass. iii) Muscles and joints: No paralysis and all joints with free movements. (iv) Nervous System: Perfectly normal and free from any infectious diseases. Note: Each eye must have a full field of vision. Colour blindness, squint or any morbid conditions of the Eye or lids of either eye will be deemed to be a disqualification. Must be free from apparent physical defects like Knock-knee, Flat Foot, Vericose vein, Bow legs, Deformed limbs, irregular and protruding tooth, Defective speech and hearing. Candidates should produce a medical certificate in original in the form prescribed hereunder certifying to their physical fitness and eye sight without glass at the time of Physical Efficiency Test/Endurance Test. Medical Certificate should be one obtained from a Medical Officer under the Government not below the rank of an Assistant Surgeon/Junior Consultant. This Medical Certificate shall be uploaded in the profile of the candidate and the original shall be produced at the time of certificate verification. 8. Candidates shall undergo training for one year in any of the forest training schools. 9. If appointed by Direct Recruitment, the candidate shall be on probation for a total period of 2 years on duty within a continuous service of 3 years. 12. Mode of submitting applications:-Candidates must register as per “ ONE TIME REGISTRATION” with the Official Website of Kerala Public Service Commission viz 'www.keralapsc.gov.in' before applying for the post. Candidates who have registered shall apply by logging on to the `Apply Now' button of the respective posts in the Notification Link to apply for a post. No application fee is required. Candidates can view and have a printout of the details on the registration card by clicking the link Registration Cardafter entering the home page. Candidates are responsible for the correctness of the personal information and secrecy of password. Before the final submission of the application on the profile, candidates must ensure the correctness of the information on their profile. They must quote their User Id for further communication with the Commission. Application submitted is provisional and cannot be deleted or altered after submission. The Application will be summarily rejected if non compliance with the notification is found in due course of processing. Documents to prove Qualification, Community, age etc. have to be produced as and when called for. 14. 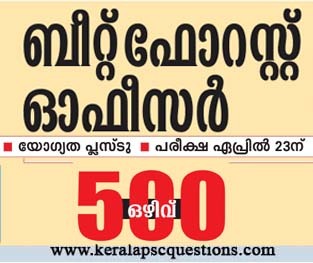 If Written Test/OMR Test is conducted as a part of the selection, Admission Tickets of eligible candidates will be made available in the website of Kerala Public Service Commission. Candidates are instructed to download their Admission tickets as per the instructions given in the website.